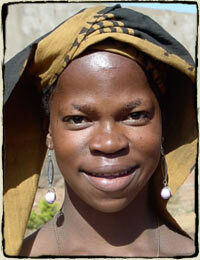 As with the others, Korotoumou is unsure of her exact age but thinks she's about 15. She is Bamanan and lost both her parents at a very early age. Koro, her four brothers and a sister were raised by and presently live with her Aunt and Aunt's children in a very poor neighborhood where they pay $20 a month for one room. Confronted with multiple life challenges, Koro had no alternative but to beg. She engaged in the system of renting two babies from a woman to draw attention to herself. On good days Koro received from $3 to $6 of which half would be given to the woman for renting her children. After arriving at the center, we noticed Koro's haggard face and disassociative behaviors. On further investigation, we discovered that from the age of 5, Koro was forced into prostitution and drugs. With the intervention of Hèrè jè staff and her teammates, Koro is now out of that difficult situation and vows never to get herself back in that untenable position. Korotoumou has become the center's expert loom weaver producing the cotton used for scarves, placemats and pillows which are Bogolon mud painted.